Allowances Committee Report and Financial Expenditure - The total expenditure towards pay & allowances for 36 lakhs Central Government employees for the year 2015-16 is Rs 1,50,028.57 ( in crore) , Out of the total expenditure of 1,50,028.57 crore, the percentage expenditure on Pay, Dearness Allowance (DA), House Rent Allowance (HRA) and other allowances are Pay Rs 55,162.69 crores (36.77%) , DA Rs 64,304.33 crores (42.68%) , allowances constitute Rs 30561.55 crores of which HRA Rs 6,225.14 crores ( 4.15% ) and. Transport Allowance constitute Rs 6186.05 crores and other allowances 16.22% respectively. ITEMS FOR THE NATIONAL COUNCIL JCM STANDING COMMITTEE TO BE HELD ON 3 rd MAY 2017 – CONFEDERATION ITEMS. The JCM was set up as a machinery to enable the employees to hold discussions with the Government and avoid confrontation and strike. At the beginning all the non-gazette employees had representatives at the JCM, National, Departmental and regional level Councils. However, in the case of CSS and CSSS the Government had permitted even the Group B. Gazetted officers at the level of the Section officers to have representations both at the National and Departmental levels as a special case taking into account the characteristics of their job content. The classification of posts in Central Civil services underwent change thereafter. SBI will charge fee ranging 50 to 100 plus service tax in case on non-compliance with MAB requirements..
State Bank of India or has introduced minimum balance requirement in savings accounts from April 1. The minimum balance requirement for SBI customers varies depending on geographies such as metro, urban, semi-urban and rural. If the minimum balance drops below a particular threshold, SBI will charge a fee from the account holder. SBI says the minimum balance in your savings bank account is the monthly average balance - the average of daily balances in the account during the month. SBI requires its savings bank account customers in metros to maintain a monthly average balance of Rs. 5,000. Grant of Maternity Leave - Clarification is issued by CGDA regarding maternity leave admissible to a female government servant consequent upon death of the child(s) shortly after birth, the women employees may be granted Maternity Leave of two months for recovery after delivery of the child. 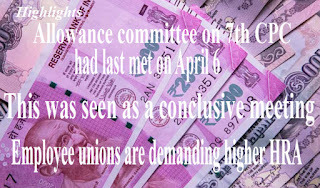 The allowance committee had held a meeting on the issue of 7CPC alloawances on April 6 which some employee union officials termed as "conclusive", however a top employee union official said that the allowance committee looking into the 7th CPC recommendations is likely to submit its report to the government soon. 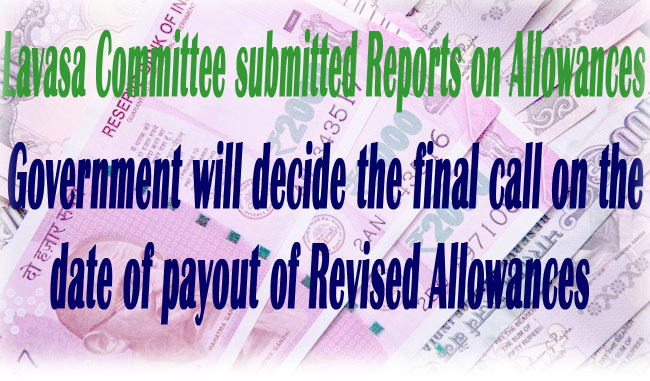 There has not been any official word on whether the allowance committee has been submitted its report. In the beginning of every fiscal year, employees are asked for details like their investment in ELSS (Equity Linked Savings Schemes), insurance policies, house rent, home loan, education loan etc. by their employer to arrive at the annual tax liability of an employee. This annual exercise also helps you do tax planning for the year. Based on the declaration, your employer calculates TDS or tax deducted at source. The employer will deduct tax from salary and deposit it with the tax authorities. Starting April 1, 2017, some income tax laws have changed. DoPT denies Media News about extension of working hours of Central Government employees. 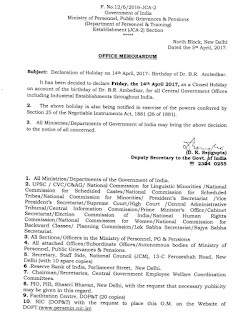 The attention is drawn to the media news about extension of working hours of Central Government employees by the Department of Personnel and Training (DoPT), Ministry of Personnel, Public Grievances and Pensions, Government of India. DoPT clarifies that there is no such proposal under consideration of the Central Government and the media reports regarding extention of working hours from 09.00 AM to 07.00 PM is false and baseless. LTC - Clarification regarding admissibility of flexi-fare in Shatabdi/Rajdhani/Duranto trains. Committee on Allowances has concluded his exercise as the last meeting was held on 6th April, 2017 and the confirmation of the submission of report to Govt. has not yet available from authentic sources. Cabinet Secretary has already assured to JCM that he will put-up the report to the Cabinet for early approval. 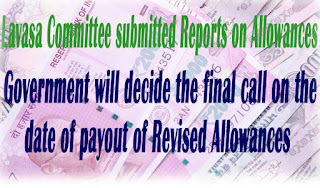 There is an indication that govt is considering for compensation to Central Government Employees for inordinate delay of implementation of the allowances as per recommendation of Seventh Central Pay Commission. 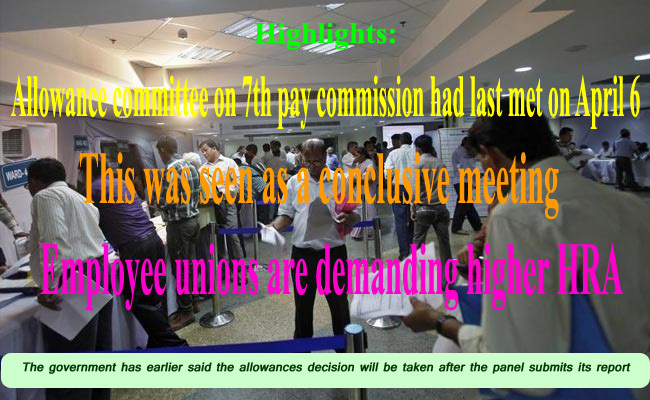 7th pay commission: HRA to be revised under 7 CPC, Lavasa committee recommendations; Key highlights. The committee is also considering revising the rates in accordance to the Dearness Allowance that is paid to the employees. 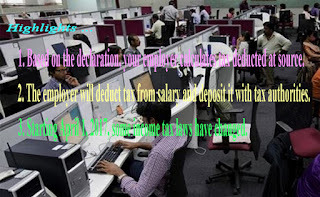 ***New Delhi, April 14: Major changes are could be made to the salaries of central government employees, with the Ashok Lavasa committee all set to submit its recommendations for changes in allowances under the seventh pay commission. While the committee is looking at abolishing or subsuming various allowances, it is particularly focused on revising the current rates of the House Rent Allowance (HRA). Mass Dharna in Front of Finance Minister’s Office on 23.5.2017 – Confederation. 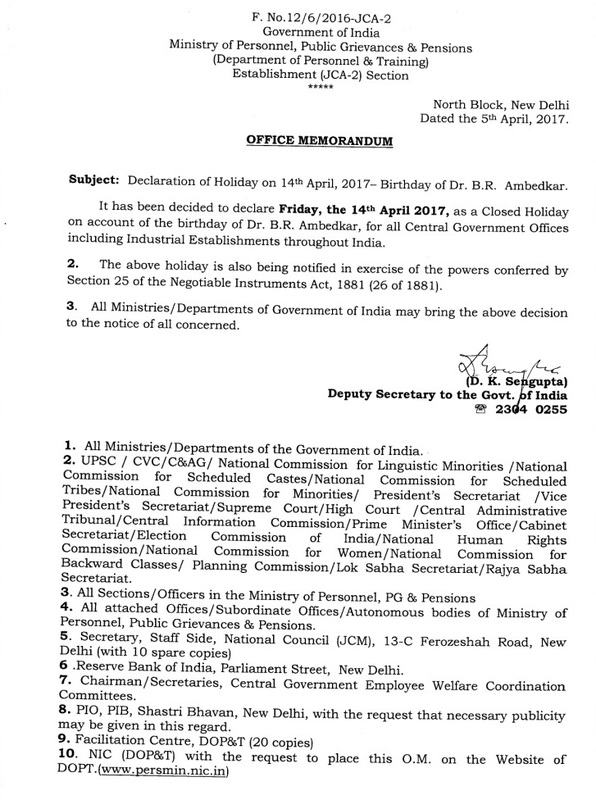 Confederation of Central Govt. Employees & workers, 1st Floor, North Avenue PO Building, New Delhi - 110 001 Circular Dated 13-04-2017 Urgent/Important, Confederation National Secretariat decided to intensiry the struggle MASS DHARNA in front of Finance Minister's Office, North Block, New Delhi on 23-05-2017 (Tuesday 12 AM to 4 PM). *Nationwide demonstration at all important centres on same day more than 2000 Central Government Employees and Pensioners will participate in the protest dharna. GPF Rules Press Information Bureau Government of India Ministry of Personnel, Public Grievances & Pensions GPF RULES w.e.f. from 7th March 2017, Government has simplified and liberalised the conditions for taking advance from the fund by the subscribers for education, illness, purchase of education, illness, housing, purchase of motor vehicles etc. On the basis of the interest compounding /payment. built-in in the schemes, interest rates on various Savings Schemes from 01.04.2017 has been revised as given in this post.